Our favourite upcoming mod for Oblivion has just been updated yet again. Antiscamp has commited to putting out a constant stream of updates and improvements which haven’t failed to impress me yet. As usual this update adds a little bit of everything to the rapidly expanding mod. My personal favourite addition this round is the new Jungle area which I look forward to adventuring in. You can check the mod out for yourself over at the ModDB page. – Merged the previous updates into one .esm-file. – Did numerous minor corrections and additions. – Started the landscaping of the newly created western areas. – Did balancing of creatures, armours and weapons and such things. – Created a jail. No more stealing stuff and being let off by the guards. Now you will go to prison. 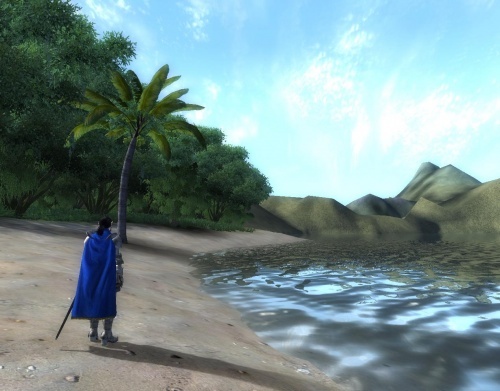 – Added capes and cloaks in different colours to decorate NPC’s. Redressed many NPC’s as a result. – Added a new weapon, the Crusader Sword. – Added Woodlander armour and bow. – Added Wheelbarrow and Palisade meshes. – Created Woodlander Bandit Camp in the Western Great Forest. – Added a new creature, the Tiger, which inhabits the western areas. – Added Jungle Trolls to the Far West as well. – The Civilized East is not so safe anymore. Added some Highwaymen to the roads. – Wrote another in-game book “The Lost Crusade”. – Updated the in-game map. I’m still not satisfied with the coordinates of the markers, but it’s a WIP.